Systematisation vs creativity in behaviour change: How does HBCP fit into this debate? 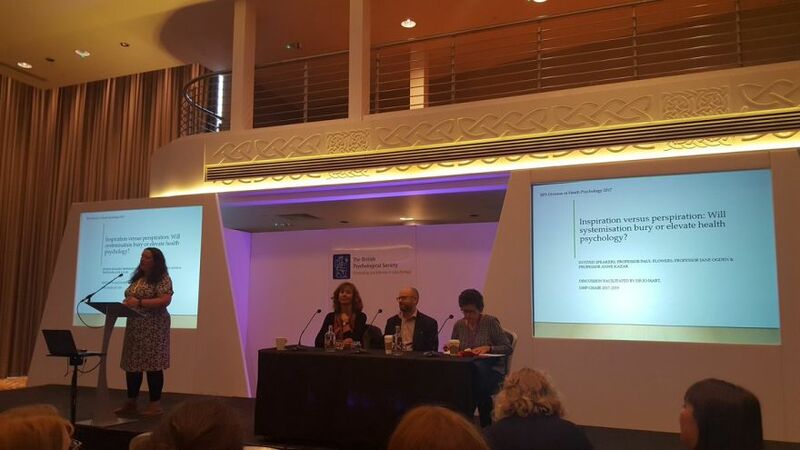 The British Psychological Society’s Division of Health Psychology (DHP) Conference took place in Cardiff on 6-8 September 2017 and was attended by Human Behaviour-Change Project (HBCP) Research Associate Emma Norris. Emma presented an outline of HBCP as part of the ‘Intervention Development’ programme stream at the conference. Another highlight of the conference was the DHP’s first live-streamed expert panel debate entitled: “Inspiration versus perspiration: Will systematisation bury or elevate health psychology?" This debate was chaired by incoming DHP Chair Dr Jo Hart (University of Manchester) and featured the conference’s three keynote speakers as panel members: Professor Jane Ogden (University of Surrey), Prof Paul Flowers (Glasgow Caledonian University) and Prof Anne Kazak (University of Pennsylvania). Topics discussed included whether it can possible to have a consensus over behaviour change theory and terminology, whether behaviour change has become over-representative of the field of health psychology and whether systematisation of behaviour change may lead health psychologists to become ‘extinct’. Follow this link to view the full debate online. Where does the Human Behaviour-Change Project fit into this debate? HBCP extends previous work by Prof Susan Michie and colleagues creating ‘taxonomies’ of behaviour change (hierarchies of concepts, such as the Behaviour Change Techniques Taxonomy v1), by developing an ‘ontology’ of behaviour change interventions (extending taxonomies with complex relations between concepts). In applying this ontology to the scientific literature, the project aims to organise the fragmented knowledge on behaviour change interventions, converting it into a form that enables the efficient accumulation of knowledge and new insights to be made. By organising, or ‘systematising’ terms and relationships used in existing published literature, HBCP aims to build the science of behaviour change. Use of a universal language based on the ontology is intended to facilitate communication between researchers, policy-makers and practitioners on the complex nature of behaviour change. Engagement by behavioural, information and computer science experts as well as wider stakeholders is embedded throughout our work to ensure maximal suitability and relevance of the project. By helping to synthesise the existing evidence base and generate new insight for potential effective interventions, HBCP aims to fast-track progress in behaviour change and reduce the likelihood of ineffective interventions. Hence from the perspective of HBCP, we very much agree that systematisation can help elevate the field of health psychology. Over the course of the project, we look forward to providing updates to support this viewpoint. We welcome continued discussions related to this debate and the project.